Friday, September 14, 2012 . Two things I love: great design and women entrepreneurs. 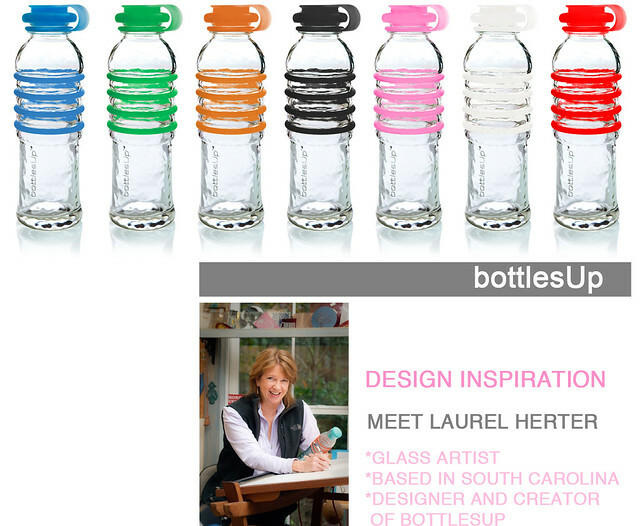 Meet Laurel Herter, she’s a glass designer that has been in the business for 30 years and recently designed and launched bottlesUp, a really cool glass bottle line with silicone grips. They are dishwasher safe and fit in gym and car cup holders (important!). They also donate 1% of every sale to 1% For the Planet and 5% of the pink bottle sales go to the Breast Cancer Research fund. When you drink out of glass bottles you are ingesting no plastic chemicals. Here’s to drinking great tasting water, which we should all probably drink more of. I also love that it’s a 22 oz bottle and that the glass is super sturdy. They’ve yet to hear of a broken bottle. Fun fact: they’re made from recycled tequila bottles. Cheers! Have a great weekend! What’s inspiring you right now?